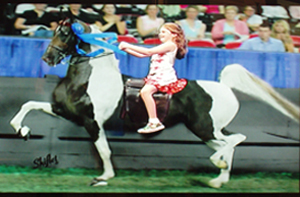 A popular exhibit is the Blue Screen that allows you to see yourself riding a champion Saddlebred! Closed: January 1st, Thanksgiving Eve Day, Thanksgiving Day, December 24th, 25th, and 31st. Admission tickets include the entire Kentucky Horse Park. Discounts: AAA members, Military and seniors 62 and over receive $1.00 off each general admission ticket purchased. These and other promotional discounts must be presented at the time of ticket purchase. Only one discount per transaction. Group pricing available for groups of 15 or more. Directions: From I-75 (north and south): The Kentucky Horse Park is located at exit 120, one-quarter mile east of the interstate. Directions: From I-64 (east and west): Take I-75 northbound to exit 120, the Kentucky Horse Park is one-quarter mile east of the interstate.